Are you constantly sleeping too warm at night? Or maybe too cold? Well, we may have found a solution. Say hello to the BedJet, a climate comfort system designed to create a cooler or warmer sleeping environment by blowing air into one of their AirComforter sheets or underneath your own personal linens. With over 90% five star reviews, BedJet is the #1 customer recommended cooling and heating product for beds on Amazon. Is BedJet going to be able to live up to the hype? This week Sleepopolis is putting it to the test to find out! In a rush? Click here to skip down to the review summary. 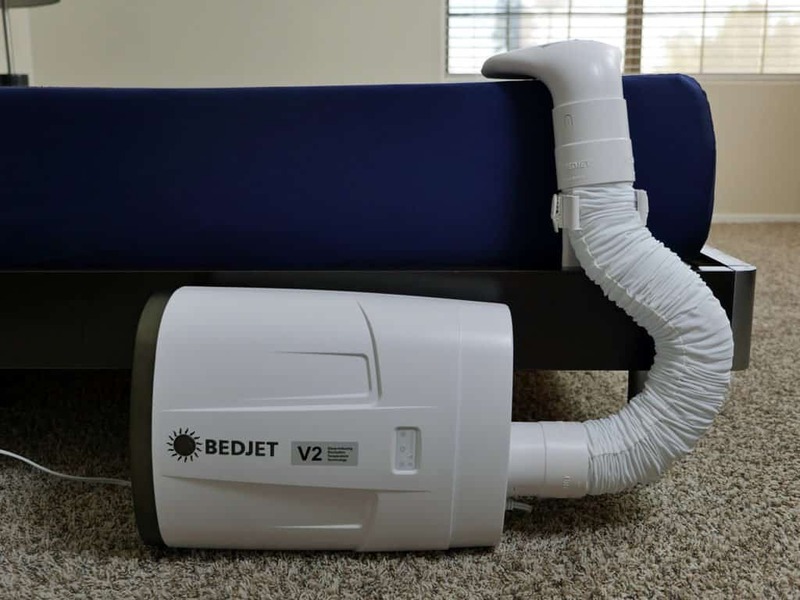 The BedJet is a climate comfort system designed to create a cooler or warmer sleeping environment by blowing air into one of their AirComforter sheets or underneath your own personal linens. Assembling the BedJet was a simple, pain free process. After removing all of the pieces from the packaging, it took me about 5-7 minutes to fully assemble the BedJet and decide where I was going to place it under my mattress. No tools are necessary during the assembly process. 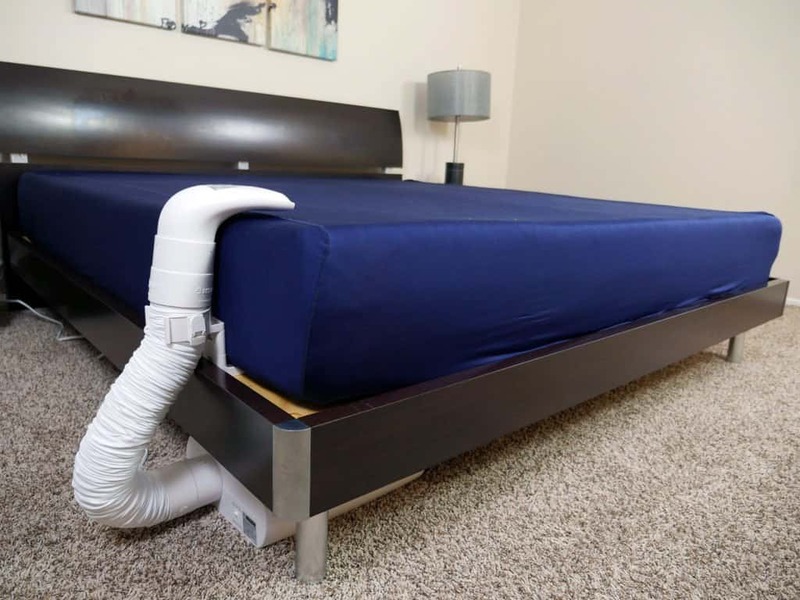 The process included removing links within the mattress bracket to determine the height at which the hose will need to sit in order to achieve maximum airflow. After doing so, the hose can be attached to the mattress bracket as well as the base of the BedJet. Finally, plug the machine in and you’re good to go. The performance of the BedJet is one of the most important topics. If you’re willing to spend the money on a product like this, you want to make sure the system is actually going to provide the cooler or warmer sleeping environment you’re looking for. As winter approaches, some nights are beginning to feel cooler than others. Therefore, I decided to test the heating feature of the BedJet first. After setting everything up I quickly hopped under the BedJet sheet set and turned the system on. Initially, I could feel the warmth that the sheet and system were creating. As I crawled into bed later that night and really put the BedJet to the test, I was impressed. The heating feature did an excellent job of providing me with the level of warmth I was looking for. Additionally, if I got too warm, I had the ability to use the remote, or my smart phone, and turn the temperature down. The same goes for the cooling function. The only difference is the temperature at which the air blows out of the BedJet hose. The BedJet pulls from the coolest air in the room – the room from the floor – and circulates it through your bedding to cool you off. This is incredibly effective for bedroom temperatures under 79 degrees. Overall, the performance level was strong for both heating and cooling. Noise was definitely a concern going into this test. However, BedJet has special acoustic damping technology built into the case and air delivery system. This makes it one of the quietest sources of air from any small consumer appliance. The noise is a very soothing background white noise and similar to your household HVAC register. BedJet’s highest fan speed and Turbo bed warming settings are extremely powerful and do generate more noticeable noise than this, but Turbo-heat mode is limited to running for maximum of 10 minutes. Turbo-heat is just too powerful for all night sleeping but it feels great when you get in – no other product can warm the bed by 30 degrees in five minutes like the BedJet! Typical all night sleep settings are with the fan speed set at around 50%, which is incredibly quiet. The medium settings are quieter than any bedroom window fan or air conditioner. During my test I preferred to turn it on the maximum level for about 5-10 minutes before getting into bed so it was already nice and warm / cool, and then turn the fan down to one of the lower settings. 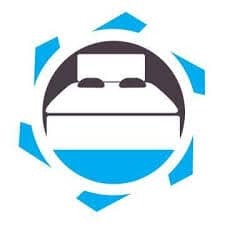 The lower and medium fan speed settings were not loud enough to be a nuisance.For sleepers who are in need of a cooler or warmer sleeping environment, the BedJet is certainly a product that should be considered. You have several options as to where you can actually place the system, depending on how you (or you and a partner) would like to receive the airflow. By placing the unit at a corner of the mattress, the air will favor one side of the mattress. If you place it at the center point of the foot of the mattress, the air will be more evenly distributed across the mattress. Having the option of moving the BedJet around is another nice extra. The BedJet has a couple of neat features as well. Although you can use the remote that is included with the system, you also have the option of downloading their free app and controlling the unit from your smart phone or tablet via Bluetooth. This is actually the method I prefer. 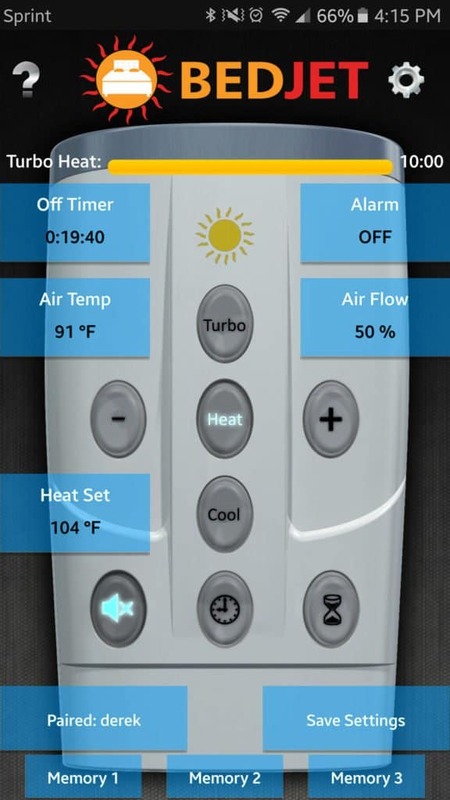 The remote is nice, but the app has a few more options in terms of temperature control, timers, and alarms. When changing the temperature / airflow on the phone, you actually have the ability to select an exact number. Whereas on the remote, you have to keep clicking the plus or minus button until you have reached a level that seems fitting. FAQ: What’s the best cooling mattress? The same process applies to the timer feature. On the remote, you have to click the timer until you find the amount of time you’re looking for. On the app, you are able to select the exact amount of time you’d like to set the timer for, ranging from 20 minutes all the way up to 2 hours. One of the coolest features on the BedJet is the biorhythm sleep technology (only available on certain BedJet models). The biorhythm technology is able to provide you with precise control over the heating / cooling cycles throughout the night. Additionally, it has the ability to incorporate waking you up into the plan, if you so wish. Basically, the plan shows you exactly what times you will be receiving warm and cool air. Once you hit your REM cycle (deepest sleep), the BedJet will begin to pump cooler air out at a low rate. Having a cooler sleeping environment is preferential during REM sleep as it improves the quality of rest. Throughout the entire sleep cycle, the airflow percentage may increase or decrease as well. This just depends on how you fill out the short biorhythm questionnaire they ask on the app (3 questions). This cycle of cool and warmer air is entirely customizable. 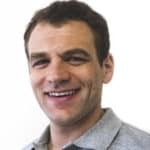 BedJet provides the rhythm patterns as a starting place, but suggests tailoring them to your preferences and desires as you begin to better understand how your sleep cycle works. All in all, the BedJet has some neat features. The versatility of the remote and downloadable app is impressive and really brings the value of the system up. If you’re a fan of sleep gadgets or just want to find the product that helps warm or cool you down during sleep, the BedJet is an excellent option. If you’re looking for the full on BedJet experience, you also have the option of purchasing their AirComforter sheet. This sheet is similar to a normal sheet, but fills with air when using the BedJet. The Dual Zone AirComforter option creates two independent zones that can be cooled or heated. Depending on how many units you have determines how many sides of the sheet will actually inflate with air. If you’re only looking to heat or cool one side of the AirComforter sheet, you will only need one BedJet. On the other hand, you will need to purchase two BedJets if you’re looking to fill both sides of the sheet to your preferred temperatures. With a Single Zone AirComforter, one BedJet can be used for cooling or heating throughout the entire bed. During my testing of the AirComforter sheet, I found that I actually enjoyed using the sheet more so than just allowing the BedJet to blow air along my feet, underneath my comforter. The sheet was nice because it filled with air and created a more consistent temperature across the entire length of the sheet. 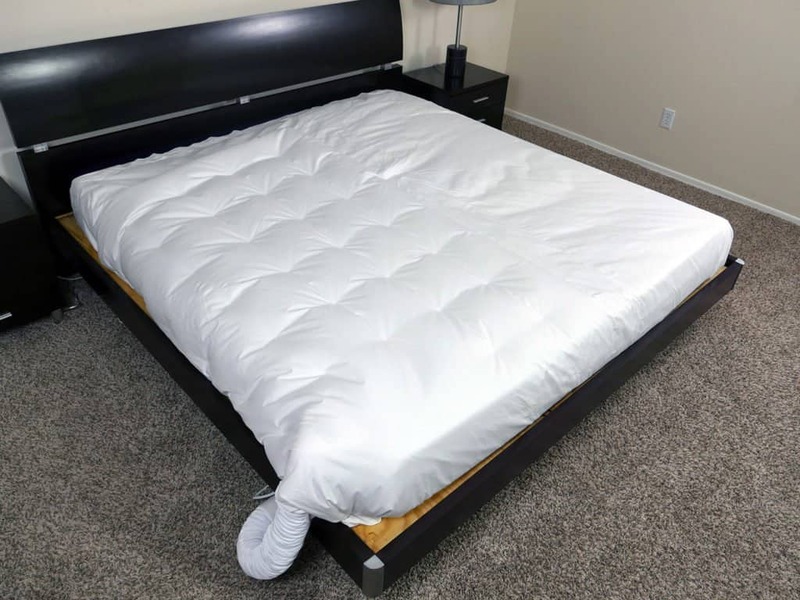 On the other hand, not using the sheet means the air pumped out from the BedJet simply flows along your feet and floats around under the sheets or comforter, whichever you prefer. Personally, I’m a fan of using the AirComforter sheet. I enjoy how the sheet confines the air in a single space, allowing me to benefit fully from the system’s features. I would certainly consider having 2 of these so that both myself and my wife could experience the individual chambers created by the sheet / BedJet combination. 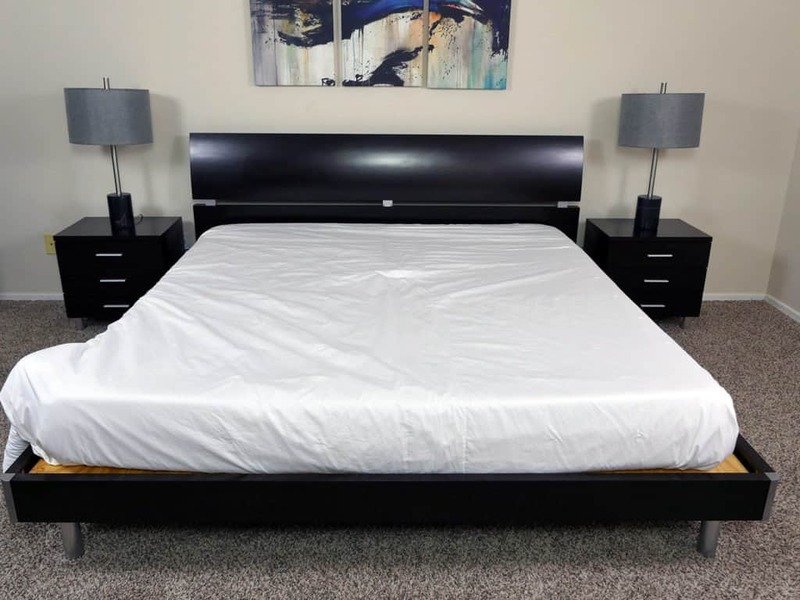 Although the sheet is a bit pricey – $139 for a Queen size – I believe it is well worth the extra money if you are already investing in the system. Lastly, the sheet seems to be very well made. There are 4 chambers along the bottom of the sheet where the BedJet hose actually slides in. This is how the air actually flows into the sheet, allowing it to inflate and remain inflated. Each of these openings were tightly stitched and did not have any loose threads or impairments that I could find. In addition, I ran the sheet through a normal wash / dry cycle and only saw a shrinkage of 2%. This is among the very least shrinkage scores I’ve tested to date. If you are not sure if it’s worth the extra cost you can always buy the BedJet system without the sheet and try with your comforter / blanket / duvet first. While I think having the AirComforter sheet is a nice addition, the BedJet still does a pretty solid job even without it. Accessories– Vertical bracket mount & AirComforter sheet sold separately. AirComforter is included with the Dual Zone model. Who should buy the BedJet? Sleep excessively warm or cool during the night– if you’re a sleeper who struggles with sleeping warm or cold, the BedJet could be a great solution. Additionally, if you’re someone who simply wants to have control over the temperature at which you sleep, this technology may be a dream come true. Couples who can’t agree on comfortable sleep temperature –With a Dual Zone sheet, the BedJet would be an ideal solution for couples who have different sleep temperature preferences. The Dual Zone AirComforter allows cooling/heating on one side of the bed without disturbing the other side. With a full Dual Zone system ($839), which comes with two BedJet units, both sides can be heated or cooled simultaneously. Will benefit from the sleep cycle temperature feature–If you are the type of sleeper who is warmer and/or cooler at certain portions in the night, the BedJet’s free app gives you the ability to better control the temperature at exact and automated times. This helps to maintain better rest and better REM cycles. Don’t mind spending the money– at $329 for the most basic model, the BedJet is not exactly inexpensive. That said, the cost of poor sleep has a high cost. Improved sleep can have a positive impact that far outweighs the cost of the BedJet for many sleepers. The BedJet is an interesting replacement to more traditional electronic blankets and mattress pads. It functions as a strong addition to any mattress, driving cool or warm air under the sheets, duvet, or comforter. The smart phone integration and other advanced features are nice extras to an ultimately solid product. For sleepers who are too hot or too cold at night the BedJet can help provide a more comfortable sleeping surface on your mattress.